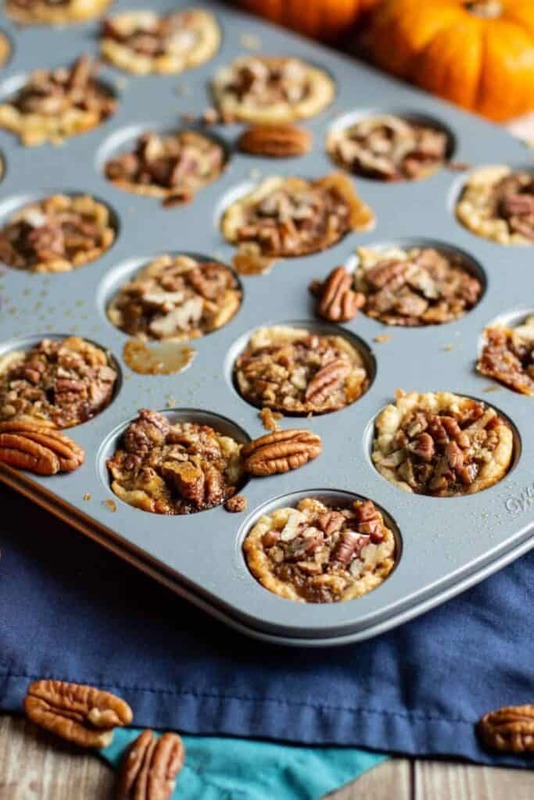 These bite-sized Mini Bourbon Pecan Pies are undeniably delicious. And their tiny size makes them perfect for sharing. They would make great party food and also be very welcome at a cookie exchange. 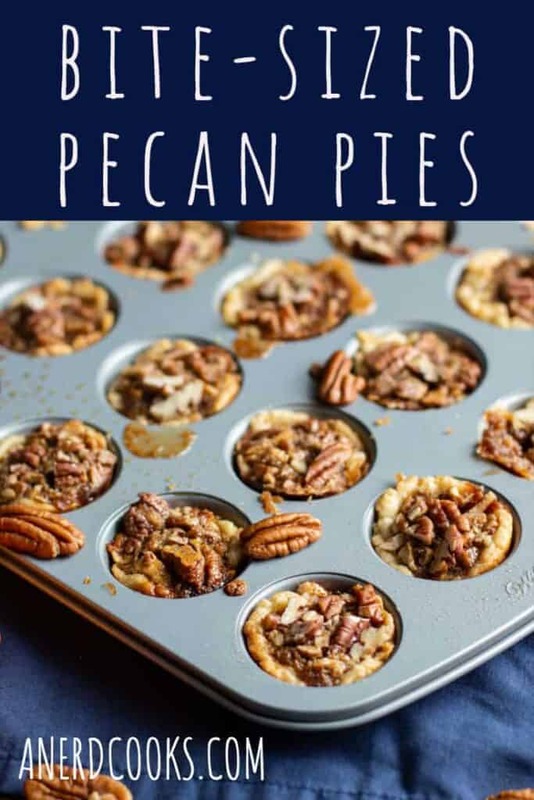 Like I mentioned when sharing these No-Bake Bourbon Balls with you, I made these mini bourbon pecan pies for a bourbon-themed birthday party. What could be better? You can feel free to dial back the amount of bourbon that’s added to these pies. However, since the party was bourbon-themed, I wanted to make sure that the bourbon flavor was pretty pronounced. The recipe for the pie filling comes from Brown Eyed Baker, though I added bourbon and kosher salt. Lightly grease a mini muffin pan with butter or cooking spray. Using a round cookie cutter, cut 48 2- to 3-inch rounds (slightly larger than the opening of the muffin tin openings) of pie dough from the pre-made, refrigerated pie crusts. 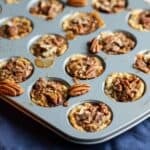 Press one round of dough into each well of the mini muffin tin. Mix all filling ingredients together and divide it evenly between the dough-lined muffin cups. 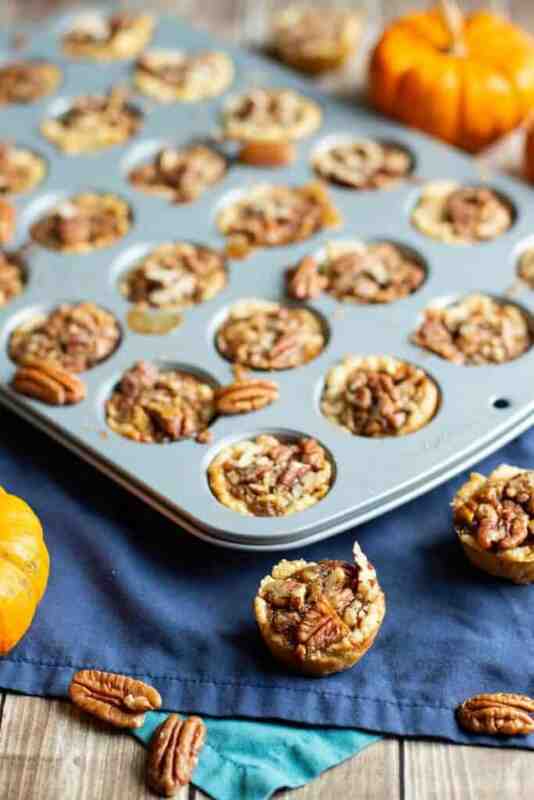 Sprinkle the extra chopped pecans evenly over the top of the unbaked pies. Bake for 20-25 minutes, or until the tops of the pies are set. Cool for a few minutes in the muffin tin before carefully removing them to a wire rack to finish cooling completely. Notes: You can reduce the amount of bourbon (or omit it entirely) if you'd like. I wanted to make sure that the bourbon flavor was pretty pronounced in these mini pies, though, so I used 1/4 cup. OMG I love how easy (and how nicely portion controlled) these are! 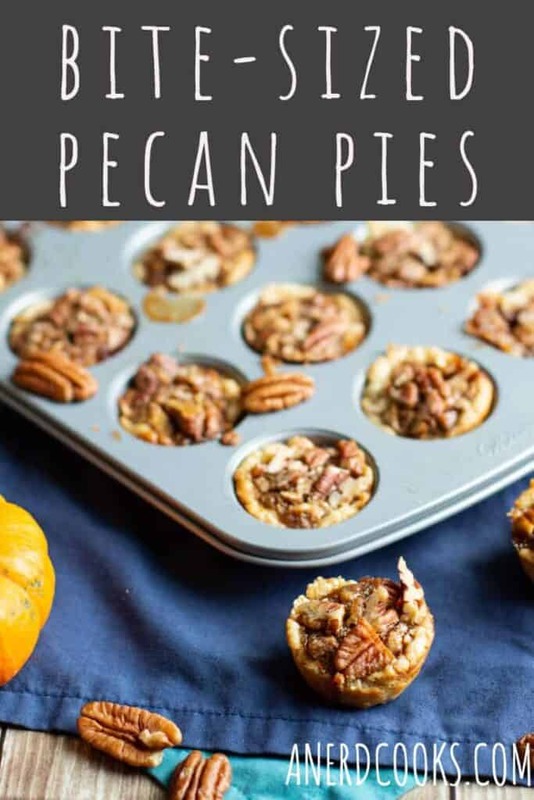 I’m definitely making them for Thanksgiving!